New Coat Painting Professionals (Painting Contractors) provides professional waterproofing in Johannesburg and surrounding areas. New Coat Painting Professionals (Painting Contractors) will provide you with waterproofing solutions at your desired location anywhere in Gauteng. With over 18 years of experience in the Waterproofing Industry we will provide you with quality and professional Waterproofing, Waterproofing Products and Waterproofing Solutions. Each waterproofing job is strategically assessed with an appropriate solution proposed to provide you with a long term result. No Waterproofing job is too big or too small. We provide Residential, Domestic, Industrial and Commercial Waterproofing. 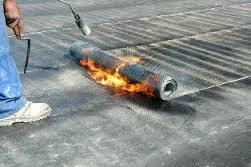 Torch-On waterproofing – Torch-On waterproofing used on concrete slabs, concrete roofs and roofs.